As the Festival of Contemporary Music was winding down, the Sunday morning concert had acquired a clubby atmosphere. By this point you recognize other audience members, many of whom you have seen perform earlier. The unusual 10:00 a.m. start time reinforces your belonging to a group of the seriously likeminded. Also, now that you are into your fifth concert, you are gathering a solid sense of the Festival’s identity, or at least its leading characteristics. 2015 has a broader, more inclusive feel than some previous years. There’s been an awful lot of percussion, which on the whole has been refreshing. There seem to be more large ensembles than in the past. The composers are especially skilled in the use of sound and timbre, so much so that the place feels a little perfumy from all the exotic sounds. There’s something a little sad, as well, since the Sunday concert is the end of the new work. Monday night’s closer is made up of pieces by Lukas Foss, Leonard Bernstein, Aaron Copland and Charles Ives, a list of names that in this context sounds grandly old and historical. There’s also been no shortage of curtain-raisers and miniatures, and Sunday’s concert opening offered a little of both. Co-curator Oliver Knussen was represented by his Two Organa, short pieces for chamber ensemble that showcase his fine attention to musical detail and construction. Their thick textures and steady pulse connect them to organum, the music of Notre Dame in the 11th and 12th centuries. The first sounds bright and diatonic thanks to the constraints of its original commission for music box. This restricted its range to two and a half octaves, and to the white keys. The second, written for a Pierrot ensemble, leads to darker and chromatic places through Knussen’s embedding the names of Reinbert de Leeuw and Arnold Schoenberg, commemorating the name of the leader and the name of the ensemble for which it was written. Although propulsive, the works have enough variation and independence among the parts that they evoke clouds of sound rather than any machinery of music. No particular melody remained in my mind when they ended, but their color still resonated. 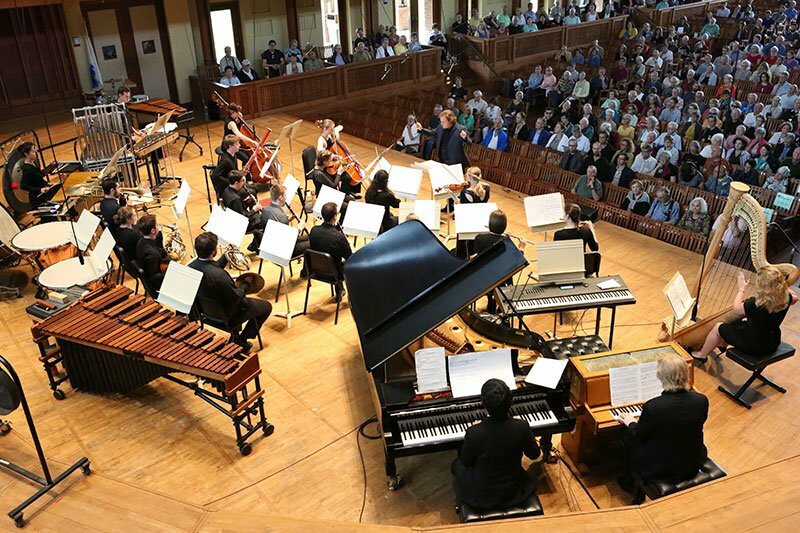 The redoubtable Jonathan Berman led Tanglewood Music Center Fellows, who here and again in the later Turnage piece stepped in on short notice for new father Stefan Asbury. Thursday night’s concert featured Critical Moments, six brief miniatures written by George Perle at the end of his composing career. Sunday saw almost the same personnel from the New Fromm Players perform Critical Moments 2, a further nine pieces (Stephanie Bennett was playing violin on this occasion). There is not much to add to the review I wrote of Critical [reviewed here]—each distills an idea or cluster of gestures, expertly executed by both composer and ensemble. Confronted now with fifteen of them, one’s admiration is tempered slightly by the wish that the composer (who wrote them between the ages of 80 and 86) might have had the stamina to realize some of them in greater detail. Julian Anderson (b. 1967) is considered one of the first English-speaking “spectralist” composers, an uncomfortably general title applied to French composers Gerard Grisey and Tristan Murail to identify their interest in the “spectra” of sound —“spectra” here a metaphor for the overtone series and other acoustic and psycho-acoustic phenomena. In the case String Quartet No. 2 300 Weihnachtslieder (“300 Christmas Carols”), that concern is manifested in Anderson’s interest and emplyment of the unique sounds produced by bells. The subtitle to the work refers to Anderson’s mostly oblique use of a collection of post-Reformation Christmas carols as raw material. After the last few days’ plethora of instruments, one might have thought a string quartet would return one to a less elaborate sound-world: but Anderson made use of extended compositional and instrumental techniques that created its own varied and unexpected environment. In addition to the “usual” extended string techniques, Anderson calls for “vertical bowing”, in which the bow is swept up and down on the strings, creating a dry pitched rustling. At several points the players pencils bounce off their strings in a rapidly drumming pizzicato. Compositionally, Anderson requires the performers to play in non-tempered modes derived from the resonances of bells. Anyone who has listened carefully to the pitches audible when a large bell is struck knows just how “out of tune” they can sound. This gives Anderson’s lyric lines a twist that can be weird, uncanny or even heart-rending. The work itself unfolds quickly in seven short movements, all of which end with vertical bowing, evoking a bird-like evaporation. For all of its odd techniques, the work’s heart is serious and affecting. For most of its length it has an emotional inevitability despite its unfamiliar language. The penultimate movement is the only one that resumes normal tuning, a choice that brightens the tonal colors, but seems to lose focus at this point, though ending touchingly. There is little Christmas here beyond the one of Robert Southey’s The Burning Babe, a vision of the holiday that foregrounds the terrible earthly fate of Christ while not forgetting the promise of that sacrifice, the moving and challenging composition uncovers new expressive content in the string quartet genre. The New Fromm Players (Bennett and Zhu, violin; Jacob Shack, viola; Christenson, cello) emoted a full-throatedly, especially when leaning into those unfamiliar intervals. The programmers might have done well not to place the only two string quartets on the same program, as Oscar Bettison’s (b. 1975) String Quartet (2015, the only TMC75 commission on this concert) was forced to compete with the still potent memory of Anderson’ quartet despite the intervening intermission. This decidedly more earthbound though violent three movement piece extended moments of tight repetition. Some of this language was familiar from the processes of Julia Wolfe, David Lang and other composers in the Bang on a Can collective, but without the leavening they sometimes provide by borrowing from popular forms. Bettison writes some interesting materials: a hugely spaced ostinato in the first movement that ended with a high yell had me sketching its outline in my notes, and the ending of the work was a beautiful evocation of dissolution, but the processes in the work need some work on their proportions. The best works of minimalism have taught us that repetition is not an evil, and can even reframe what one thinks “development” is. But these repetitions felt stretched out, especially in the final movement, where the usually silent Ozawa Hall crowd had some uncharacteristic outbreaks of coughing. The New Fromm Players returned for this work. Playing with great propulsion and not shying away from the repeated grindings called for in the later stretch of the work, they also remained delicate at the end. Stephen Drury (piano), Robyn Quinnett (violin) and Sonia Mantell (cello) then appeared for a very brief, surprisingly nostalgic and even sentimental palate-cleanser by Hans Werner Henze. Adagio adagio is a study for the third movement of the composer’s Eighth Symphony, a work based on A Midsummer Night’s Dream which was composed on commission from the BSO in 1992-3. An essay in melody moving through constantly shifting harmony, it was played with delicacy and sweetness—gone almost before it was there. The closer, Mark-Anthony Turnage’s (b.1960) Dark Crossing (2000) comprises three “Etudes” for chamber ensemble that proceed impressionistically, assembling jazzy melodies, cloudy harmonies and rhythmic propulsion into a texture that might intermittently recall the seascapes of Turner; or that are perhaps just a bit murky. The first Etude has the strongest personality, evoking a bass-heavy La Mer with lots of low instruments, including a contrabassoon and a contrabass clarinet. Coming at the end of a concert that lasted for nearly two hours and forty-five minutes, at the end of five days of new music, and despite some brief dance-like moments in the second Etude that caught the ear, and the “summing up” gestures in the lugubrious third movement, Dark Crossing did not make a deep impression,.